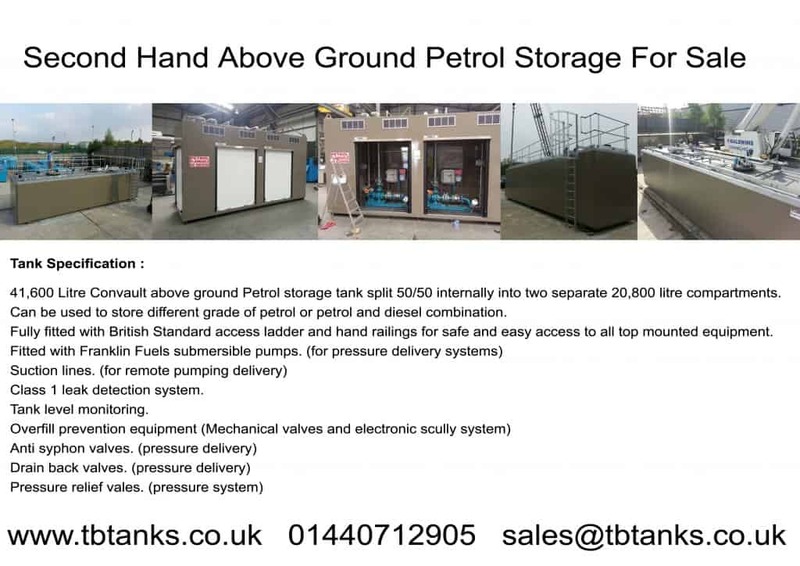 41,600 Litre Convault above ground Petrol storage tank split 50/50 internally into two separate 20,800 litre compartments. Can be used to store different grade of petrol or petrol and diesel combination. Fully fitted with British Standard access ladder and hand railings for safe and easy access to all top mounted equipment. Class 1 leak detection system. 2 x IST-2-(ATXF) 403390905 2 hp variable speed STP w/AG seals. 2 x 5874202900 EcoVFC – VFC with pump protection and diagnostics features, for 380-415V three phase input. Remote stand alone fill point cabinet for tanker delivery to storage tank. Separate pump units for each compartment. Vapour recovery system for each compartment. Emergency hand pump and dump tank system to clear tanker hose in case of uplift pump failure/power cut or other emergency scenarios.